Nov. 28 — Employers often overlook age as a diversity factor. As a result, they can lose out on many of the benefits of full inclusiveness and expose themselves to bias claims and workplace disharmony. That’s the view of several lawyers, advocates and diversity trainers who recently spoke with Bloomberg BNA about age diversity, on-the-job discrimination and managing today’s multigenerational workforces. “Older workers are getting left behind in diversity a bit,” Mauricio Velasquez said. As a result, companies aren’t always making use of the skills and value of all their employees or the available talent pool, he said. Velasquez is the president of Diversity Training Group in Herndon, Va. He has been conducting diversity training across different business sectors for 20-plus years. Misconceptions about older workers also can get in the way, according to attorney and consultant Patricia G. Barnes. “If we could eliminate the filter of age and false stereotyping about aging, we could see older workers have experience, institutional awareness, and history” with the company and that they “bring a lot of benefits to the workplace that are valuable,” said Barnes, who’s based in Tucson, Ariz.
Management-side attorney Terri Gillespie agrees. You generally don’t “see employers looking for a variety of ages” as part of their diversity and inclusion strategies, she told Bloomberg BNA. “I do think age is an untapped area in this way,” Gillespie said. A partner with Obermayer Rebmann Maxwell & Hippel LLP in Philadelphia, she provides employers with training on workplace diversity and how to integrate diverse workers into their operations. “And more diversity by age opens you up to a broader spectrum of business,” Gillespie said. Companies that focus on age as part of their D&I strategy say they’re seeing positive effects, according to an AARP policy paper released in October. The Washington-based interest group promotes independence, dignity and purpose for older people. The paper revealed the results of case studies AARP did on five employers of various sizes and from different industries, Lori A. Trawinski told Bloomberg BNA. She’s a director in the AARP Public Policy Institute. Companies that emphasize age diversity and inclusion believe they’re seeing more employee engagement, Trawinski said. That boosts productivity and benefits the bottom-line, the employers say. Diversity entails seeking the perspectives of workers from different backgrounds and with different points of view, Trawinski said. Inclusion means creating a work environment where “your diverse people can speak up and thrive,” she said. A 2015 study by PricewaterhouseCoopers, however, found that few CEOs are looking at age as part of their D&I strategy, she said. Although that study had a global focus, the participants included U.S. employers, Trawinski said. 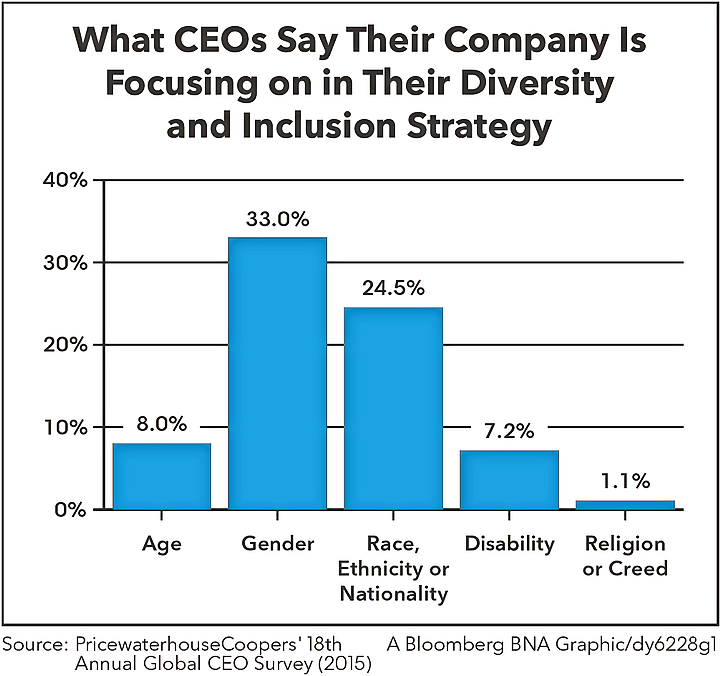 Indeed, PwC’s 18th Annual Global CEO Survey reported that while 64 percent of companies whose CEO participated in the study had adopted strategies promoting diversity and inclusiveness, only 8 percent included age as a factor in their D&I strategy. That’s more than the 7.2 percent who targeted disability and the 1.12 percent who focused on religion or creed as a D&I factor, but well behind the 33 percent who cited gender and the 24.5 percent who cited race, ethnicity or nationality as diversity factors. Race and gender diversity are “big issues in the media” and with politicians, DTG’s Velasquez said. Employers that skimp on age diversity efforts also may be engaging in discrimination and risking employment bias claims, Barnes said. A former judge, Barnes is the author of “Betrayed: The Legalization of Age Discrimination in the Workplace” and other books on job bias and workplace bullying. “When I think about age diversity, I think it’s about recognizing that older workers need to be protected because of their age,” she said. In Gillespie’s view, a company could encounter age discrimination claims if it “isn’t looking at the big picture” in its recruiting and diversity efforts. “If you’re focused only on getting the best talent” off of college campuses and developing it, older workers may feel left out and sue, she said. While it sometimes may be necessary for a company to target young talent, depending on the nature of its business and its hiring needs, employers have to be careful, Gillespie added. A lot of employers continue to see older workers as “a negative” based on the outdated and mistaken beliefs that their job skills necessarily erode with age and the emergence of new technologies and that they become too expensive to keep, according to Barnes. Workers in various industries and job types don’t all “age the same way,” Barnes said. Some workers have skills that remain relevant, while others don’t. Moreover, when companies cut older workers to save money in salaries and benefits, the costs are passed along to society in the form of Medicare, health-care and similar expenses, Barnes said. Companies cutting older workers to trim their budgets has probably cost the U.S. billions of dollars, she said. Federal Government Adding to Problem? Barnes also puts some of the blame on the federal government for what she sees as an overemphasis on younger workers. “I think age bias has gotten worse under Obama,” she said, citing a 2010 executive order signed by President Barack Obama that promotes the recruitment and hiring of students and recent college graduates. Barnes also pointed to Labor Secretary Thomas E. Perez’s July 2015 endorsement of the 100,000 Opportunities Initiative. That initiative, which is backed by more than a dozen leading U.S. employers, seeks to create pathways to meaningful employment for Americans between the ages of 16 and 24 who traditionally have faced systemic barriers to jobs and education. No one would argue that these programs aren’t important, but they shouldn’t be done in an age-biased way, Barnes said. “Instead, we should use our creative thinking” to find ways to promote the hiring of minority and other young workers, she said. “We tolerate it—even our government. It’s very discouraging,” she said. Companies also risk potential age bias claims if they’re careless in their efforts to promote age diversity or if they fail to properly manage workers from different generations, management-side attorney Angela J. Gibson told Bloomberg BNA. Many workplaces now have employees from as many as five generations. Age diversity properly includes a concern for making sure that a business has its fair share of younger workers, as well, Gibson said. But she’s seen situations where an employer has been accused of age discrimination for discussing its age diversity initiative too openly, she said. Employers that do so may leave themselves subject to allegations that they’re reserving some portion of their jobs only for younger applicants, she said. Gibson is a partner in Vorys, Sater, Seymour & Pease LLP’s Cincinnati office. Trawinski said many workforces are “less mindful” than they should be about how they speak about age and to each other. Because it appears that “very few companies have age as part” of their D&I strategy, “their training doesn’t raise age” as an issue that workers need to be sensitive to, she said. Allegations of age bias also may arise when an employer changes its promotion criteria, according to Gibson. The employer may put less emphasis on years with the company and more on education and favor workers who take a more modern, “entrepreneurial approach,” she said. That can cause older workers to feel they’re being passed over based on age and prompt them to sue. Velasquez of DTG said “almost 100 percent of the clients” he does training for have older workers who feel left out or marginalized. An older worker passed over for promotion may tell a younger new boss, “I have children your age.” That presents a problem, Velasquez said.